Bates College junior Michelle Schloss directs Fuddy Meers, the story of an amnesiac who must learn the facts of her existence anew each day, in performances at 7:30 p.m. Friday and Saturday, Oct. 15-16, and 2 p.m. Sunday, Oct. 17, in the Black Box Theater, Schaeffer Theatre, 305 College St. Admission is free; there are no seat reservations. For more information, please visit www.batestickets.com or call 207-786-6161. Fuddy Meers, a dark comedy by David Lindsay-Abaire, depicts a wild day in the life of Claire, who awakens each morning with her memory an empty slate. On the day of the action, she is whisked away into a tumultuous world where she encounters an array of eccentric characters and seeks to discover the truth about her life. The play explores themes of communication, family dynamic and the construction of femininity. “The main theme is the struggle for communication. Every character has a block they can’t seem to get through to realize or to reveal their truth,” says Schloss. 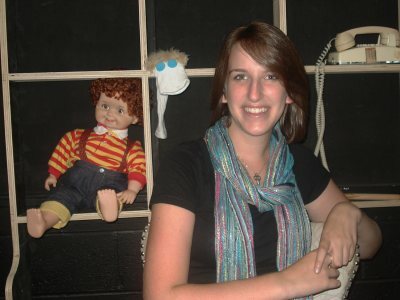 Schloss, an English major and theater minor from Unionville, Conn., is directing the play as an independent study. She had no academic requirement to direct a play, but was so inspired by Lindsay-Abaire’s play that she proposed the project. Part of her fondness for Fuddy Meers stems from what it offers Schloss as a director. “There’s so much to play with, and so much for me to write about and to think about,” she states. In the play’s comedic elements and its darker currents, her actors, too, find plenty to sink their teeth into. Schloss calls her adviser, Dana Professor of Theater Martin Andrucki, an essential force in the project, because he has kept her focused and the more absurd elements of the play in check. The cast includes junior Nora Brouder, of Westminster, Mass., as Claire; sophomore Ethan Brooks-McDonald, of Schenectady, N.Y., as Richard; and sophomore Max Arnell, of Maplewood, N.J., as the Limping Man. The production will be nominated in the Kennedy Center American College Theater Festival.